The other word for Spring is Hope. 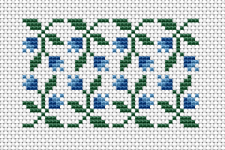 Simple and easy-to-stitch floral design in green and yellow. 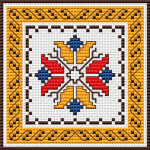 Small geometric motif in blue and yellow colors.1 and 2 strands of thread for the backstitch. 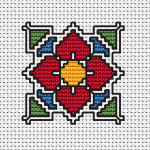 Floral motif and border inspired by the traditional Bulgarian embroidery. 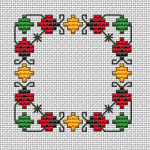 Small design with stylized ladybugs - symbols of happiness, and good luck.The chart contains full stitches ,back stitches with 1 and 2 strands and few Smyrna stitches. 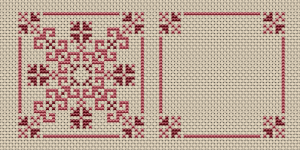 Simple biscornu pattern in pink colors.The chart contains both the front and back sides. 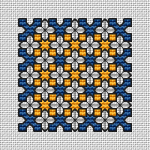 A small composition of decorative blue flowers for beginners. 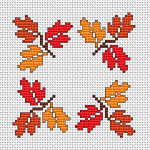 The pattern contains only full stitches. 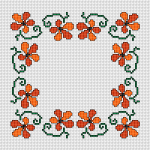 Decorative floral border in warm colors,orange and rust. 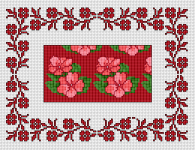 Monochrome border in red, inspired by the Busy Lizzy flower. 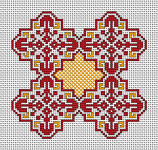 Beautiful motif in red and yellow based on traditional Bulgarian cross stitch.